We have had many comments from readers of the book that recognize looking back, that indeed, the things they saw as happenstance, were really evidences of God’s love and concern for them. What a different perspective this is when we view these circumstances in the proper light. I had a very recent powerful situation that evidences these truths again. I serve on the board of a start-up company. This company is developing world-class meaning in culture and value training—-turning values into habits. I don’t know why I serve on the board, except I have been connected with the owners for some time and they value my input (I guess). Central to their last board meeting was to develop their purpose statement. These statements often intertwine with value statements, mission statements, mantra’s, and similar platforms. The idea behind a purpose statement is to characterize why they (the company in this case) exists. In the studies of the executive team, they were studying the words of Jim Collins in Built to Last, and other great counsel. They discovered a story about a group called the PJ’s, or the United States Air Force Pararescue. From a need recognized since 1922, the special forces unit has a purpose; to rescue others so that others may live. They are the ones who go in to rescue downed pilots, astronauts in the sea, wherever the need may be, they will go behind enemy lines to bring out those who are trapped, in danger, etc.. The training to make this team is so rigorous, only five out of one hundred make it. The intense training lasts two years. It is the bolded part, “That Others May Live” that is often emblazed on their arms in the form of a tattoo. The executive team presented this information to the board, and suggested the purpose statement of the new company would be “That YOU may become…..”. There is much more to this, but I am not at liberty to divulge at this time. The point is, have a purpose statement that is short, powerful and to the point, and that states the purpose for the group/individual/companies existence. Ironically, and this is the point of my blog, to tie into this truth about NO coincidences, I flew home next to a neighbor that had this tattoo on his arm. He was about 30, good looking with olive complexion and build like a fit soldier. When he reached up to get his bag from the overhead, his t-shirt stretched up and I saw the phrase “That Others May Live”. I asked him if he was a special forces extraction specialist. He looked at me shocked, but with a sort of reverence that I noted. He said he was not, but that his dad was. He then told me that his dad didn’t talk much about his service in the military, but after he passed away they learned of his heroic acts. He had the tattoo put on his arm as a tribute. This was a very touching and powerful moment for each of us; moist eyes, tender. I couldn’t believe that at this particular moment in time, this gentlemen would be my neighbor on a flight that immediately following the board meeting discussing this special forces unit. I asked him if I could take a picture of his tattoo, to which he rolled up his sleeve and obliged. I felt like this was sort of a confirmation that what the executive team selected for this particular company was right on! I viewed this experience as a tender mercy. Tell me the odds of having this experience with the team, then on the flight home being a neighbor to a man with the tattoo of the very inspired creed we were modeling after? 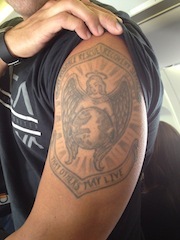 What are the chances of this happening to me at this exact time, on this exact flight, with the son of a man who bore the tattoo in remembrance of his father? What are the chances?? Remember to watch for the tender mercies; to understand the truth that there are NO coincidences. The Ministry of Business has several more examples of this which you can enjoy. Today is Friday the thirteenth in July of 2012. It’s ironic that we are flying to California on this day of superstition to celebrate the life of Mehgan Porter. About 27 years ago, we had just moved into our first home in Moorpark California. Our oldest son was five and his next brother was three. I came home from work and was running past the kitchen and eating area to put my stuff down and sit down to dinner with the family. I noted in the corner of my eye a beautiful Polynesian girl sitting next to our oldest son. I slowly retraced my steps. “And who is this wonderful young lady joining us for dinner”? I asked. I learned that my five-year-old son had met Mehgan in kindergarten and invited her for dinner! Wow—I didn’t know five year olds did that. Behind the scenes, Ryan had asked his Mom if he could do this. Ginger called the little girl’s mother, Mari, and this exchange began one of the greatest family friendships we have ever had. We learned recently that this wonderful, beautiful and precious soul would not have long to live after a protracted battle with cancer and passed on just a couple of days ago; it has made the normally joyous journey to Southern California a somber one; reflective and filled with gratitude for having knowing such an amazing young woman. Mehgan was very accomplished for her age, a law school graduate, a wonderful writer (having written a play), was serving humanity in meaningful ways and was leading a most wonderful life. We have been deeply saddened to witness this early earthly exit. Life is not fair, but our faith teaches us it is right. Still, no one accepts tragedy to youth without the process of doubt. This transition we call death works out in our minds much better if we are old. The time of separation seems less—it is the natural order of things. So with Mehgan, we are forced to deal with the painful separation longer—-even so, we all know we will eventually join her. That innocent dinner and playhouse kiss led to eternal friendships. The moments in time are frozen now as we reflect, give gratitude, and prepare our hearts to move on with the courage Mehgan has taught us. Though sorely missed as it should well be, somehow I believe she is not far from us. At Mehgan’s funeral, the family all spoke, sang, or prayed. I have never felt closer to heaven as I watched and felt the love of this family one to another. They have no doubt that the separation from each other through death is only temporary. Faith is such a beautiful thing. 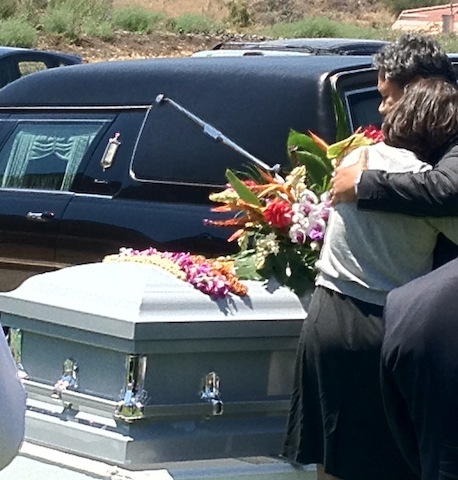 This Polynesian family put their flowered leis on the casket as songs of their heritage were beautifully sang—a hand or lips to the coffin bid a farewell—tender, no words could define the moment. I share this sacred experience with the world not in a sense of sadness, but of loss. Perhaps we can learn a few lessons from this transition; one, to emphasize what matters most—secondly, to understand the purpose of life and the meaning it can have for all of us—and finally, to not allow the swiftness of life to overshadow the times we need to be still and absorb in ways that feel beyond the realm. As we left, Ryan placed a kiss on the coffin……. Until we meet again.